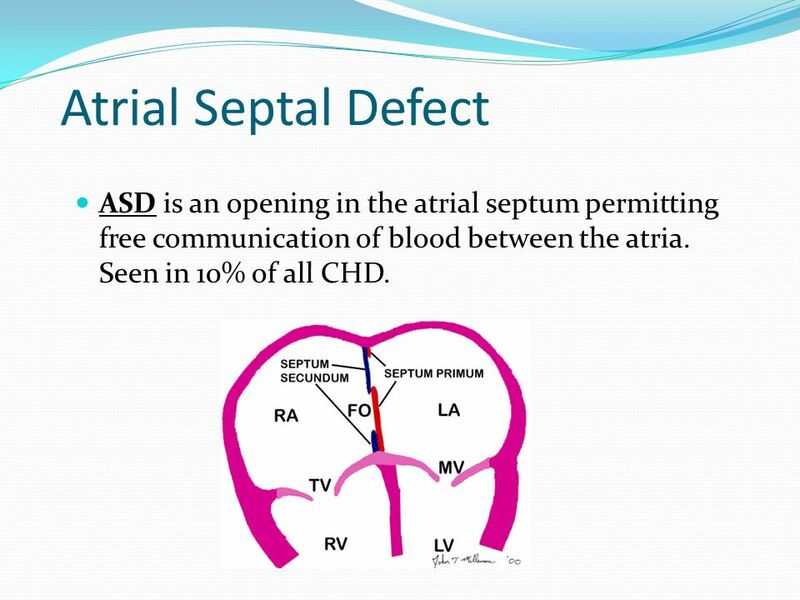 3 Atrial Septal Defect ASD is an opening in the atrial septum permitting free communication of blood between the atria. Seen in 10% of all CHD. Secundum ASD – at the Fossa Ovalis, most common. 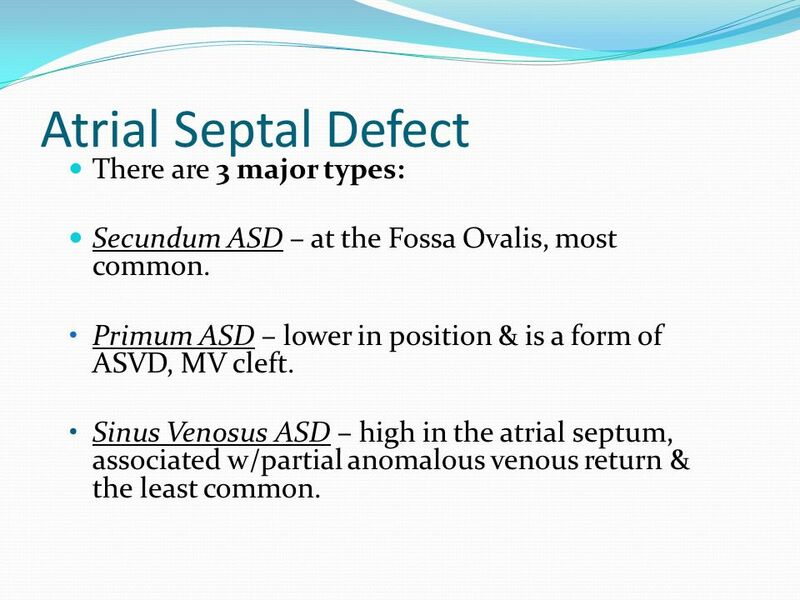 •	Primum ASD – lower in position & is a form of ASVD, MV cleft. 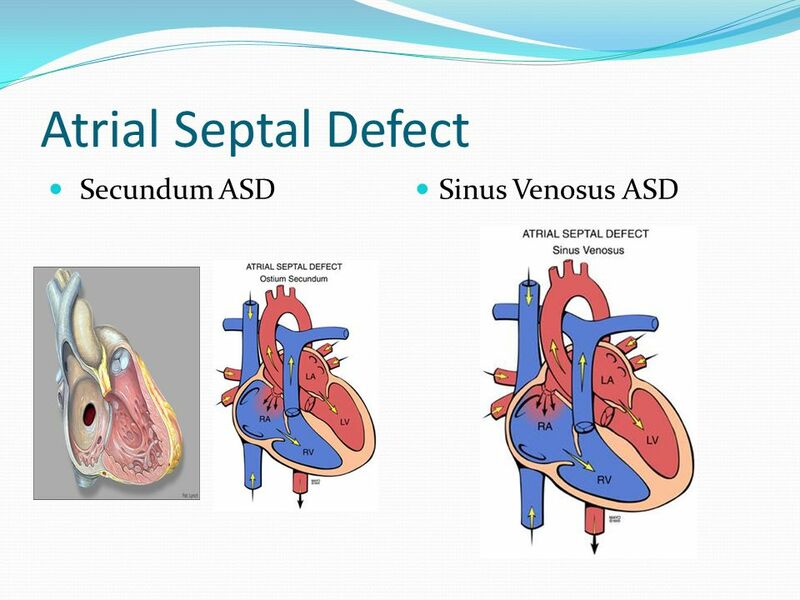 • Sinus Venosus ASD – high in the atrial septum, associated w/partial anomalous venous return & the least common. 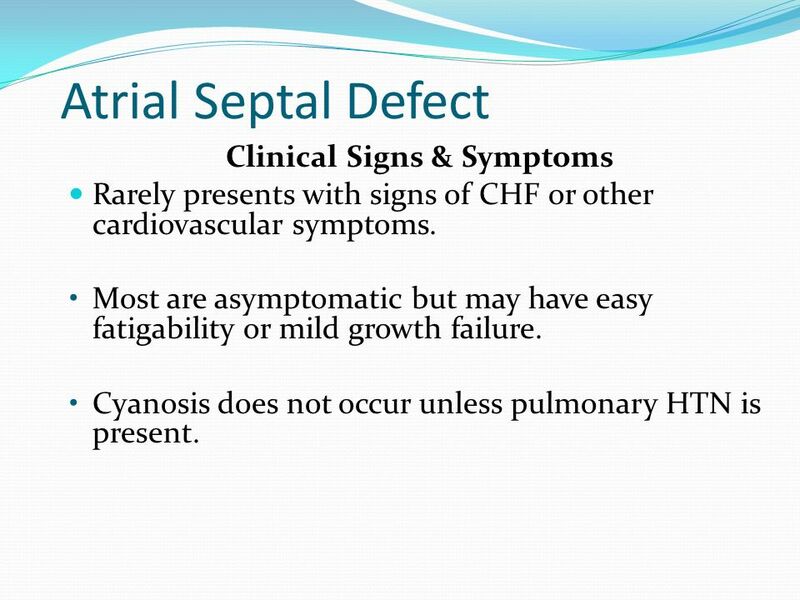 Atrial Septal Defect Clinical Signs & Symptoms Rarely presents with signs of CHF or other cardiovascular symptoms. • Most are asymptomatic but may have easy fatigability or mild growth failure. • Cyanosis does not occur unless pulmonary HTN is present. 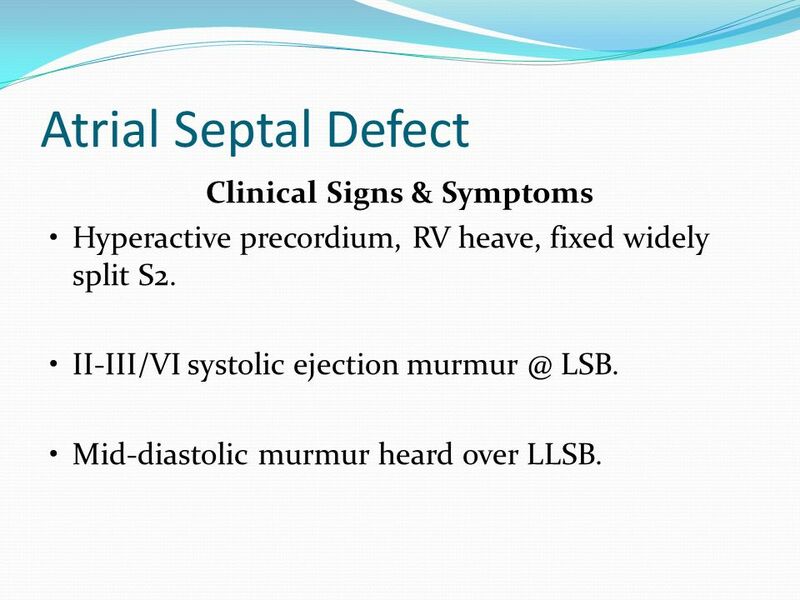 7 Atrial Septal Defect Clinical Signs & Symptoms • Hyperactive precordium, RV heave, fixed widely split S2. • II-III/VI systolic ejection LSB. • Mid-diastolic murmur heard over LLSB. 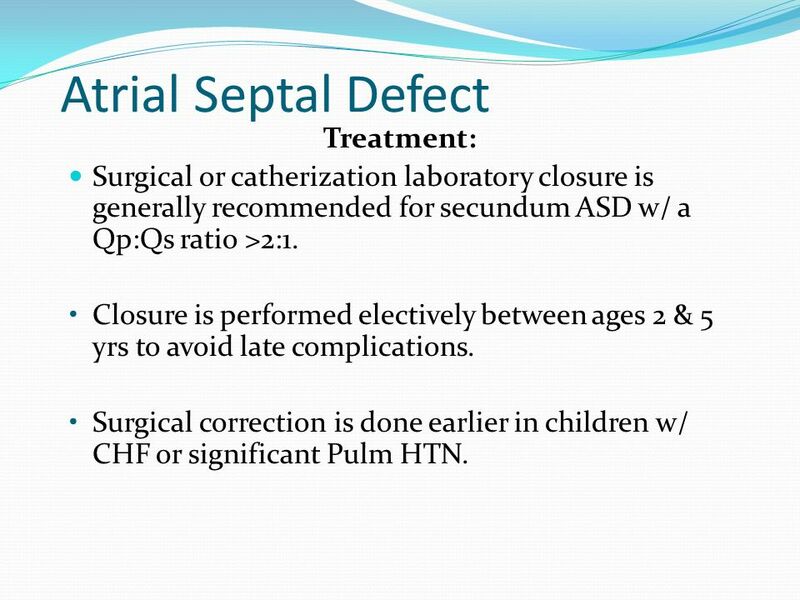 Surgical or catherization laboratory closure is generally recommended for secundum ASD w/ a Qp:Qs ratio >2:1. • Closure is performed electively between ages 2 & 5 yrs to avoid late complications. • Surgical correction is done earlier in children w/ CHF or significant Pulm HTN. 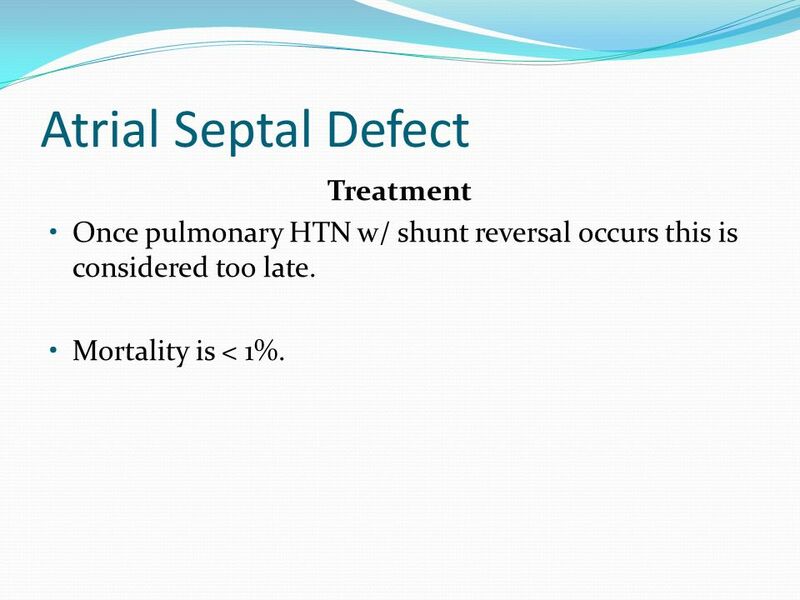 • Once pulmonary HTN w/ shunt reversal occurs this is considered too late. • Mortality is < 1%. 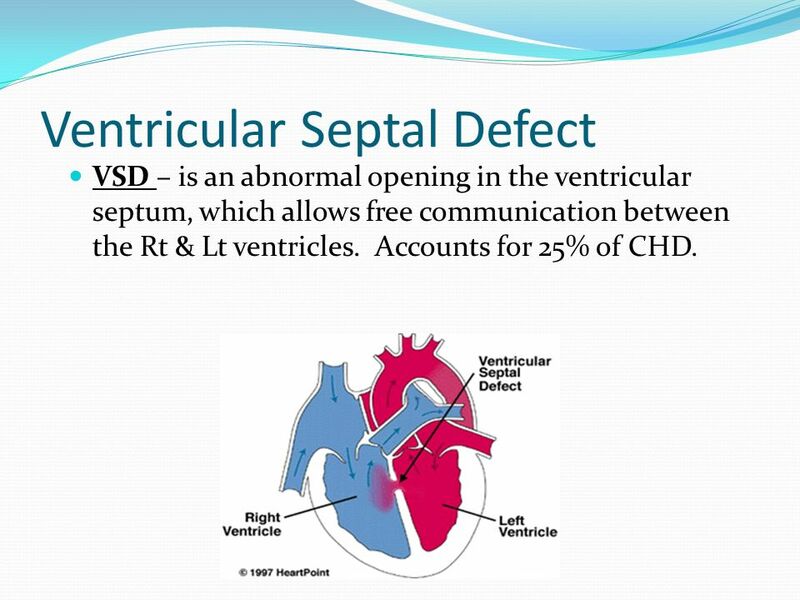 VSD – is an abnormal opening in the ventricular septum, which allows free communication between the Rt & Lt ventricles. Accounts for 25% of CHD. 4 Types Perimembranous (or membranous) – Most common. 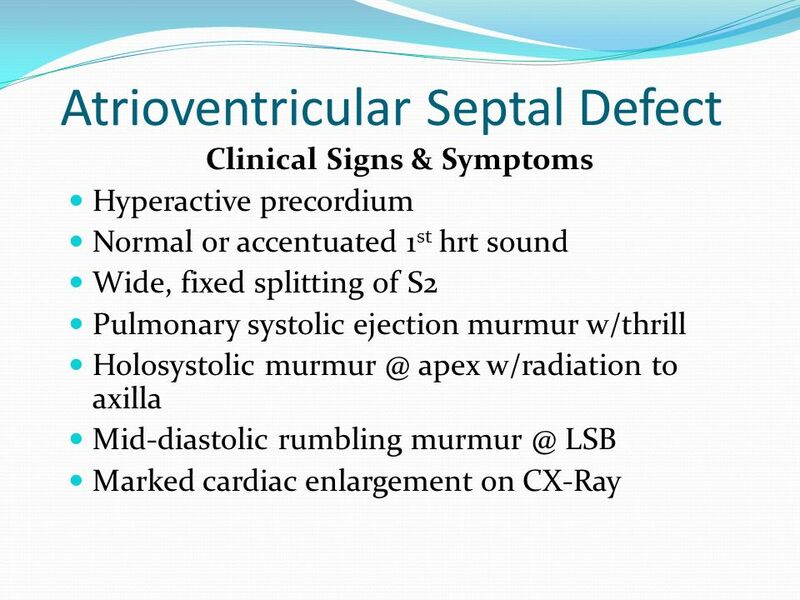 Infundibular (subpulmonary or supracristal VSD) – involves the RV outflow tract. • Muscular VSD – can be single or multiple. 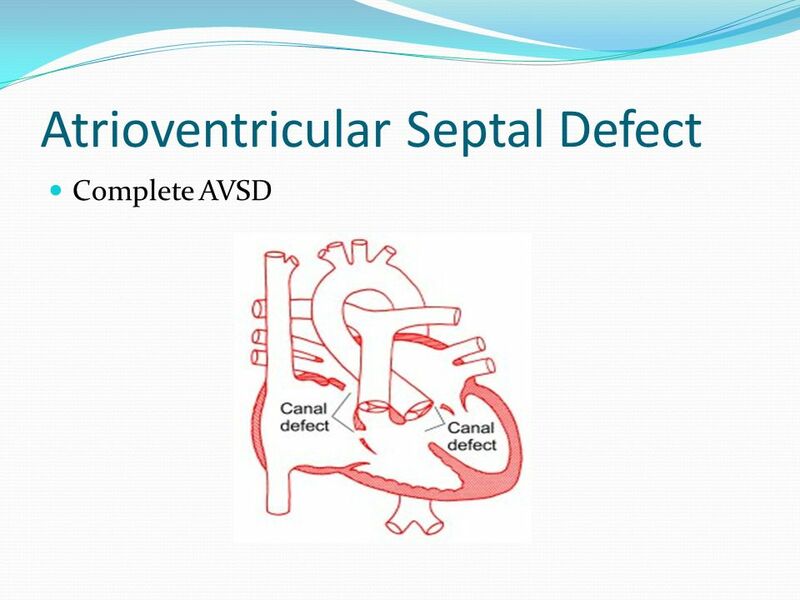 • AVSD – inlet VSD, almost always involves AV valvular abnormalities. 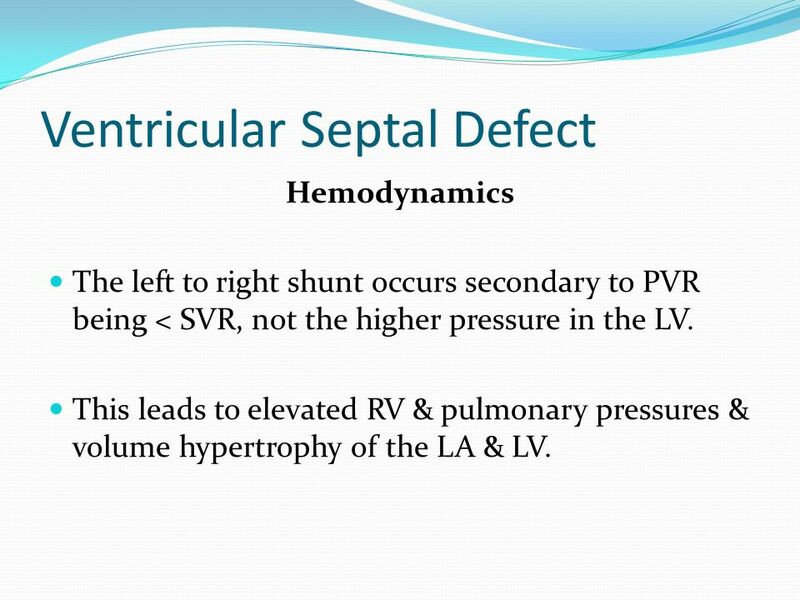 Hemodynamics The left to right shunt occurs secondary to PVR being < SVR, not the higher pressure in the LV. This leads to elevated RV & pulmonary pressures & volume hypertrophy of the LA & LV. Clinical Signs & Symptoms • Small - moderate VSD, 3-6mm, are usually asymptomatic and 50% will close spontaneously by age 2yrs. 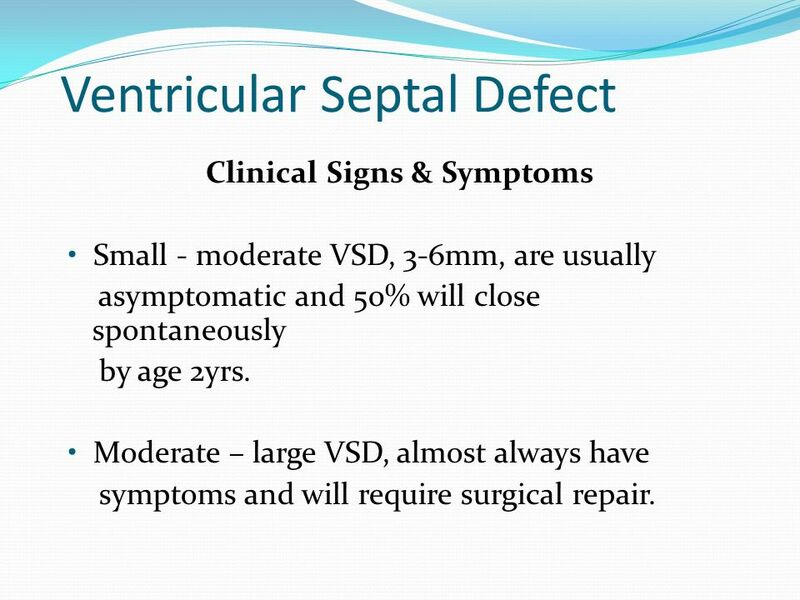 • Moderate – large VSD, almost always have symptoms and will require surgical repair. Treatment • Small VSD - no surgical intervention, no physical restrictions, just reassurance and periodic follow-up and endocarditis prophylaxis. 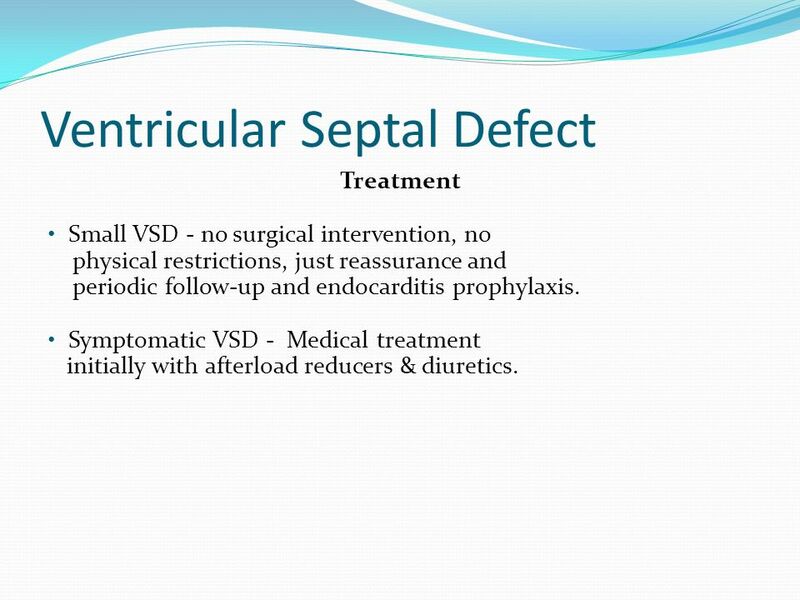 • Symptomatic VSD - Medical treatment initially with afterload reducers & diuretics. 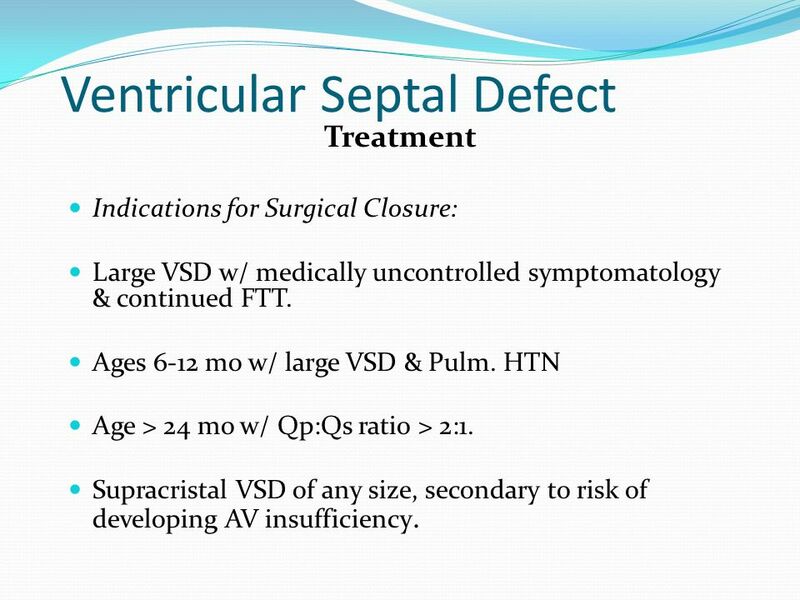 Treatment Indications for Surgical Closure: Large VSD w/ medically uncontrolled symptomatology & continued FTT. Ages 6-12 mo w/ large VSD & Pulm. HTN Age > 24 mo w/ Qp:Qs ratio > 2:1. 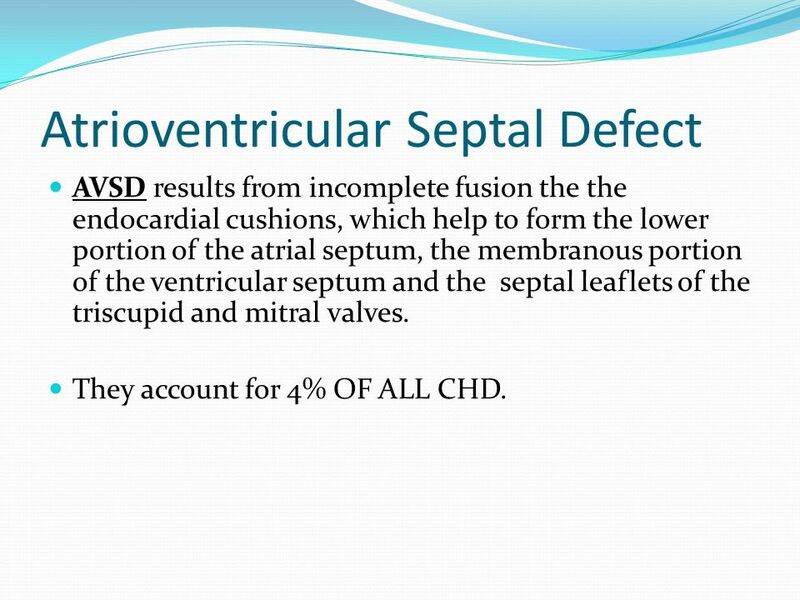 Supracristal VSD of any size, secondary to risk of developing AV insufficiency. AVSD results from incomplete fusion the the endocardial cushions, which help to form the lower portion of the atrial septum, the membranous portion of the ventricular septum and the septal leaflets of the triscupid and mitral valves. They account for 4% OF ALL CHD. Question: What genetic disease is AVSD more commonly seen in? 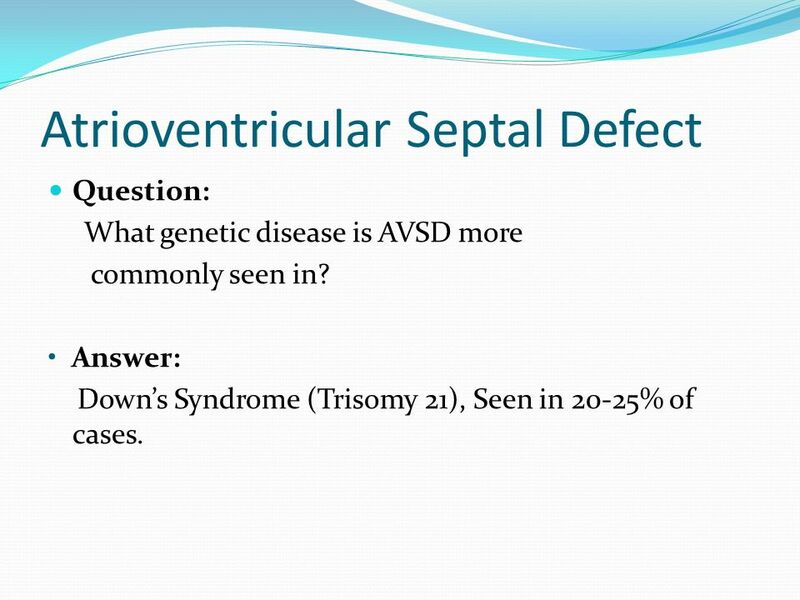 • Answer: Down’s Syndrome (Trisomy 21), Seen in 20-25% of cases. 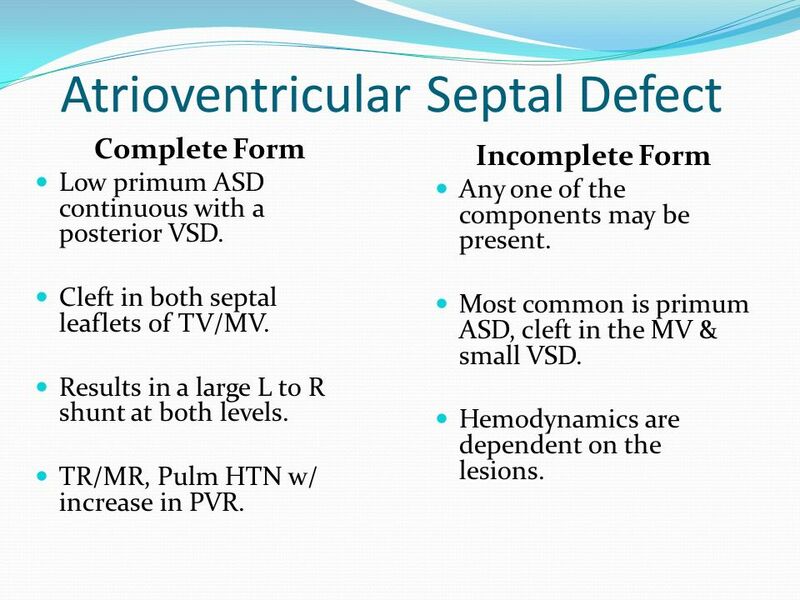 Complete Form Low primum ASD continuous with a posterior VSD. Cleft in both septal leaflets of TV/MV. 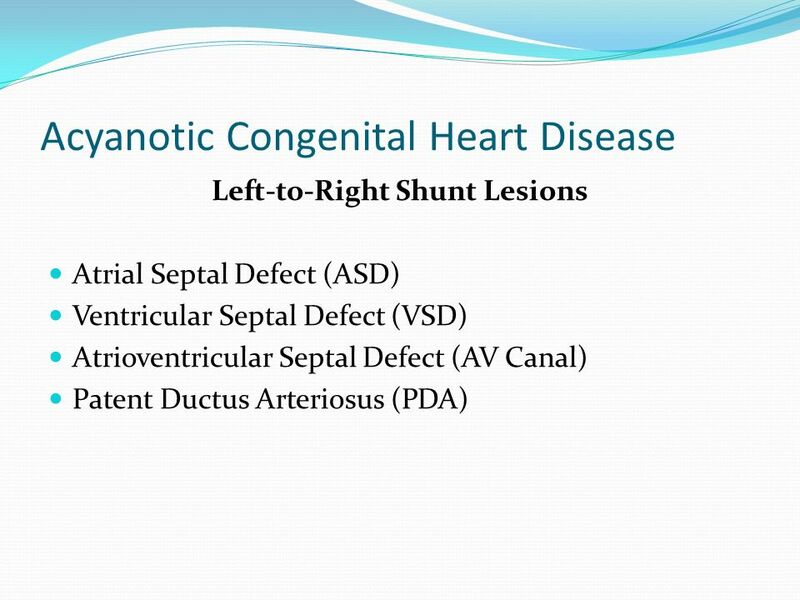 Results in a large L to R shunt at both levels. TR/MR, Pulm HTN w/ increase in PVR. Incomplete Form Any one of the components may be present. 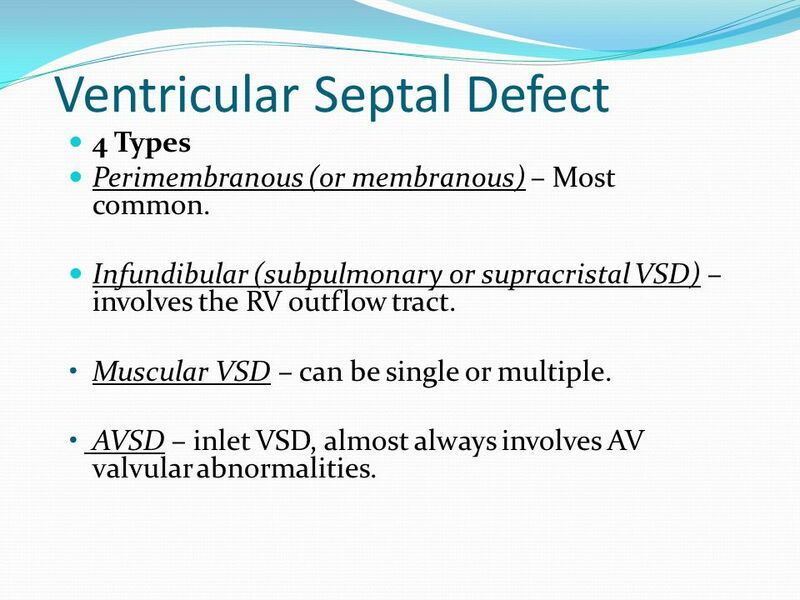 Most common is primum ASD, cleft in the MV & small VSD. Hemodynamics are dependent on the lesions. 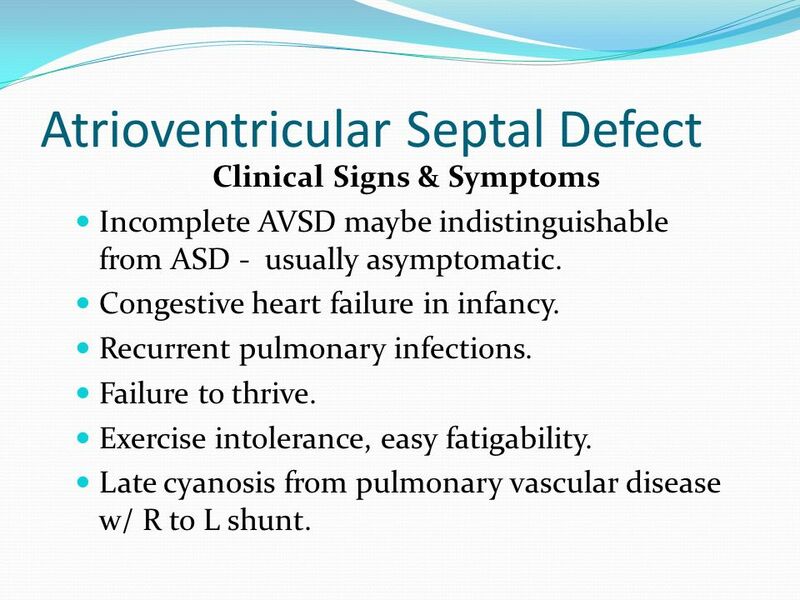 Clinical Signs & Symptoms Incomplete AVSD maybe indistinguishable from ASD - usually asymptomatic. Congestive heart failure in infancy. 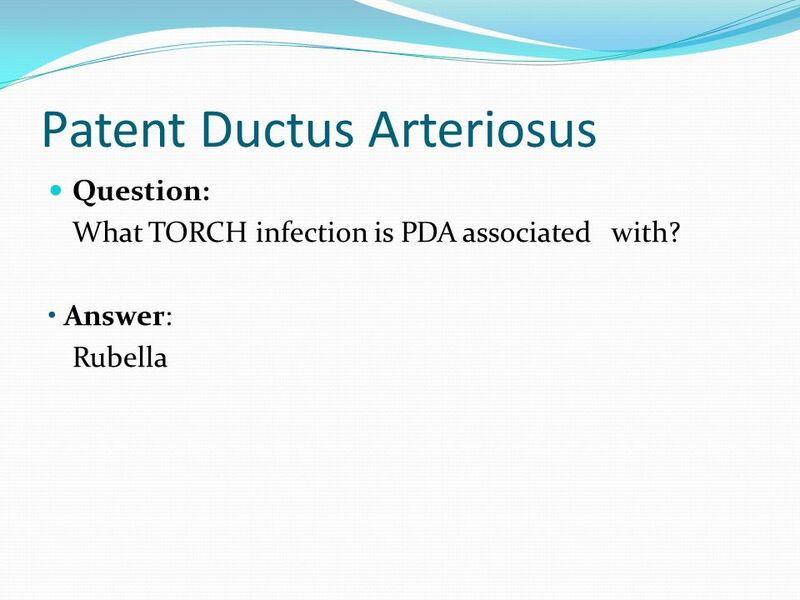 Recurrent pulmonary infections. Failure to thrive. Exercise intolerance, easy fatigability. Late cyanosis from pulmonary vascular disease w/ R to L shunt. Treatment Surgery is always required. Treat congestive symptoms. Pulmonary banding maybe required in premature infants or infants < 5 kg. 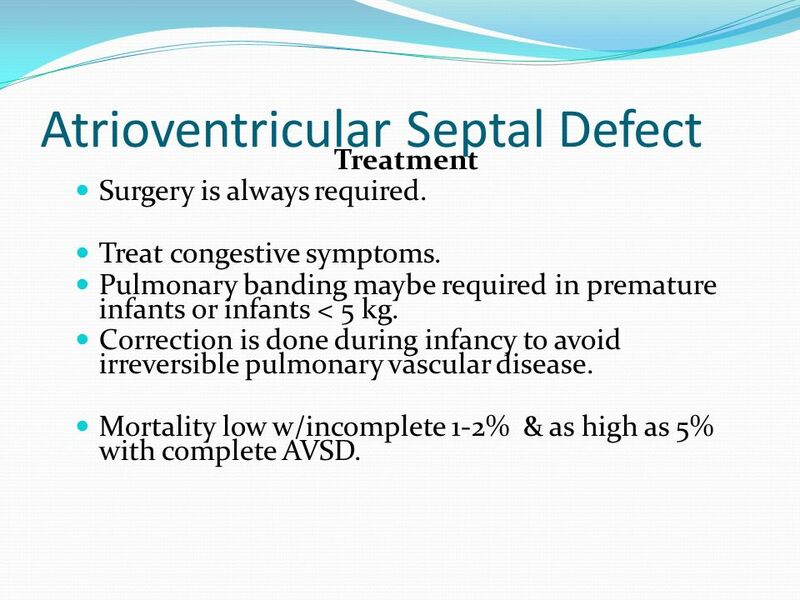 Correction is done during infancy to avoid irreversible pulmonary vascular disease. Mortality low w/incomplete 1-2% & as high as 5% with complete AVSD. 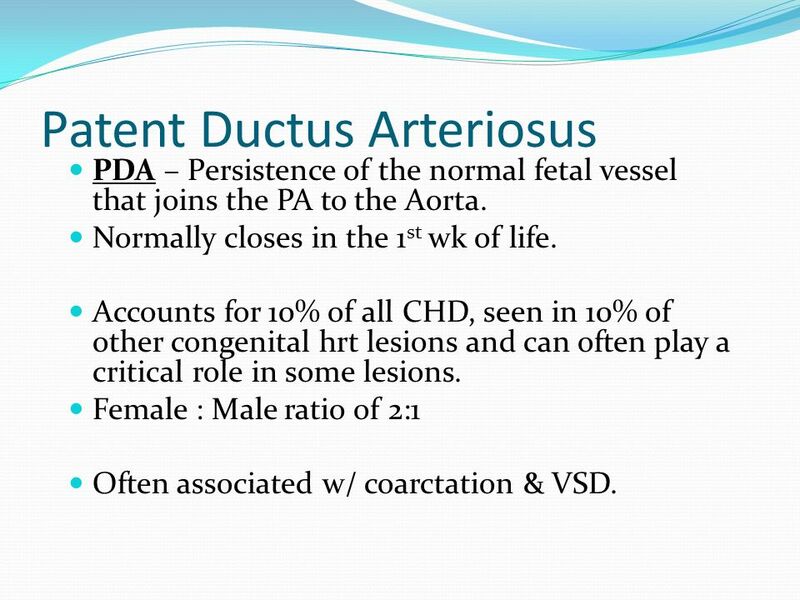 PDA – Persistence of the normal fetal vessel that joins the PA to the Aorta. Normally closes in the 1st wk of life. Accounts for 10% of all CHD, seen in 10% of other congenital hrt lesions and can often play a critical role in some lesions. Female : Male ratio of 2:1 Often associated w/ coarctation & VSD. 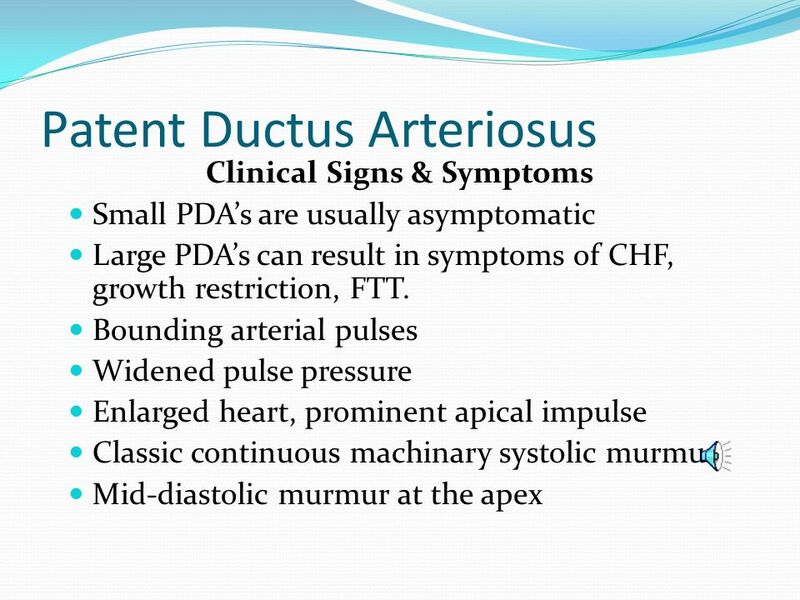 Hemodynamics As a result of higher aortic pressure, blood shunts L to R through the ductus from Aorta to PA. 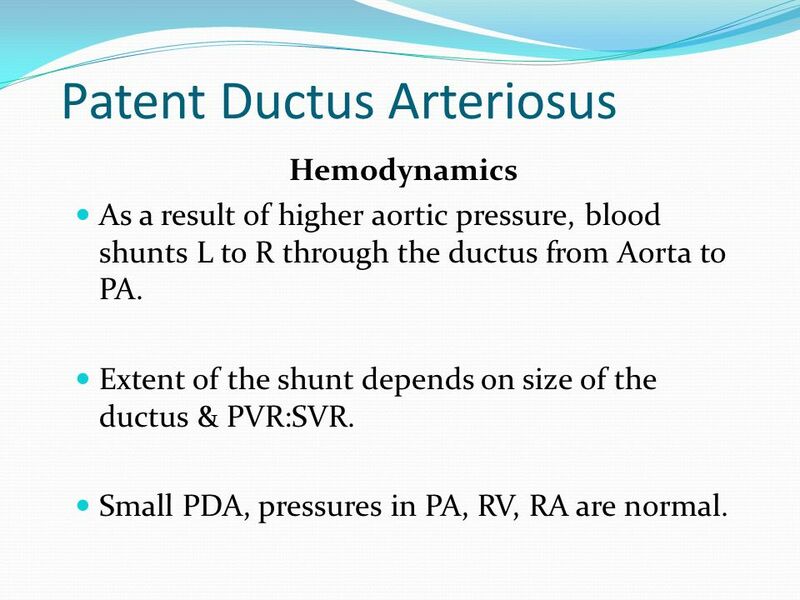 Extent of the shunt depends on size of the ductus & PVR:SVR. Small PDA, pressures in PA, RV, RA are normal. Hemodynamics Large PDA, PA pressures are equal to systemic pressures. 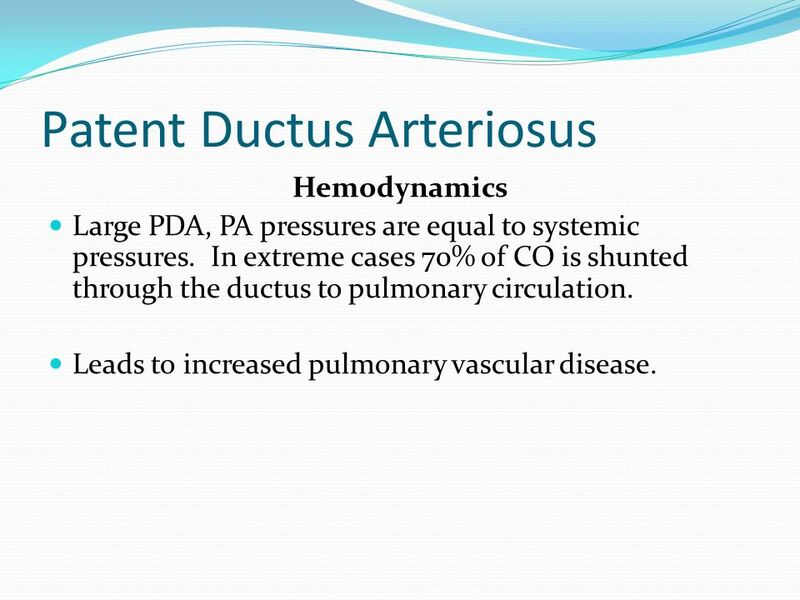 In extreme cases 70% of CO is shunted through the ductus to pulmonary circulation. Leads to increased pulmonary vascular disease. 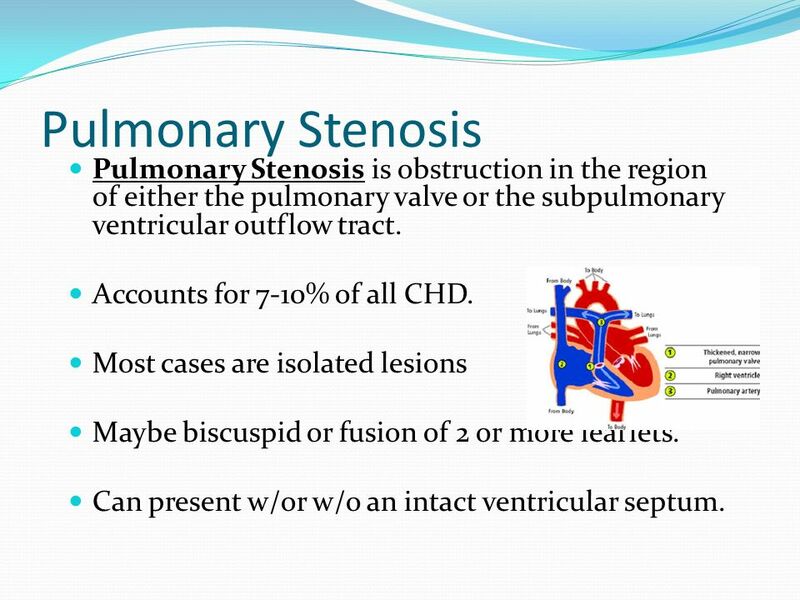 31 Pulmonary Stenosis Pulmonary Stenosis is obstruction in the region of either the pulmonary valve or the subpulmonary ventricular outflow tract. Accounts for 7-10% of all CHD. Most cases are isolated lesions Maybe biscuspid or fusion of 2 or more leaflets. 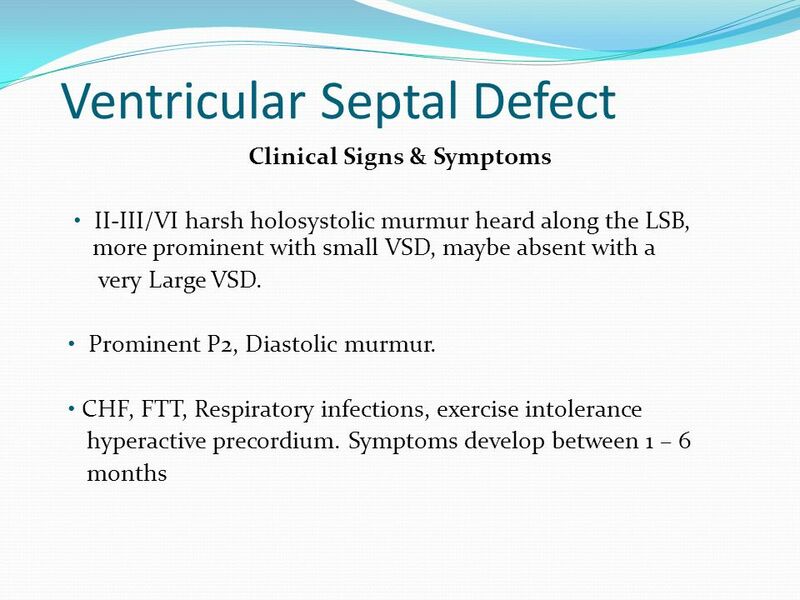 Can present w/or w/o an intact ventricular septum. 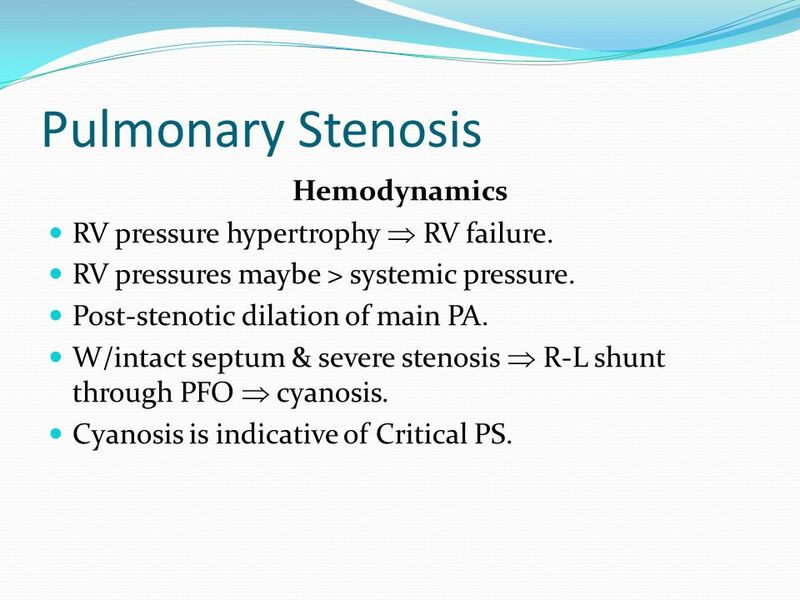 32 Pulmonary Stenosis Hemodynamics RV pressure hypertrophy  RV failure. RV pressures maybe > systemic pressure. Post-stenotic dilation of main PA. W/intact septum & severe stenosis  R-L shunt through PFO  cyanosis. Cyanosis is indicative of Critical PS. 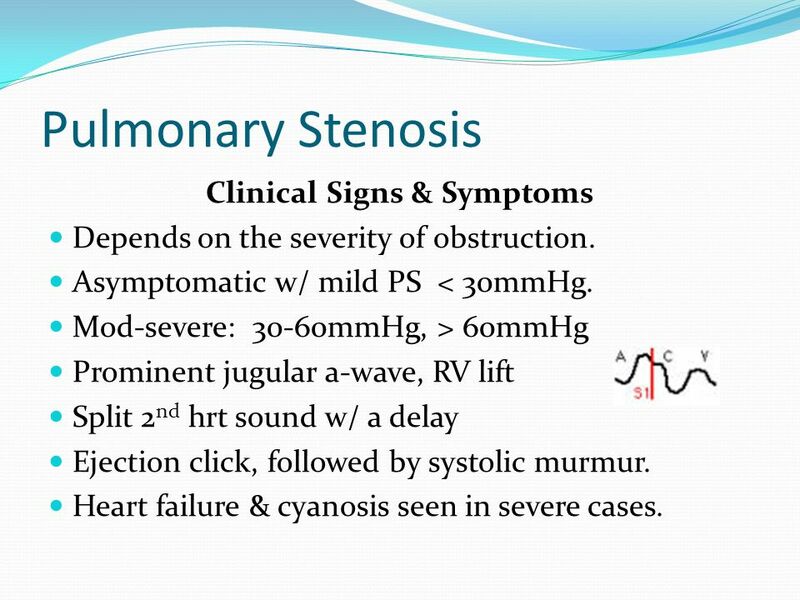 Pulmonary Stenosis Clinical Signs & Symptoms Depends on the severity of obstruction. Asymptomatic w/ mild PS < 30mmHg. Mod-severe: mmHg, > 60mmHg Prominent jugular a-wave, RV lift Split 2nd hrt sound w/ a delay Ejection click, followed by systolic murmur. Heart failure & cyanosis seen in severe cases. Mild PS no intervention required, close follow-up. 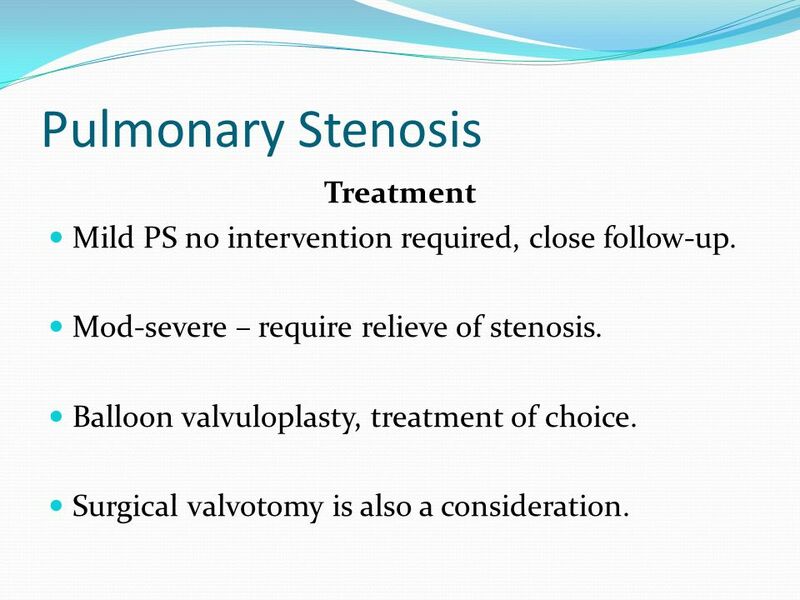 Mod-severe – require relieve of stenosis. Balloon valvuloplasty, treatment of choice. Surgical valvotomy is also a consideration. 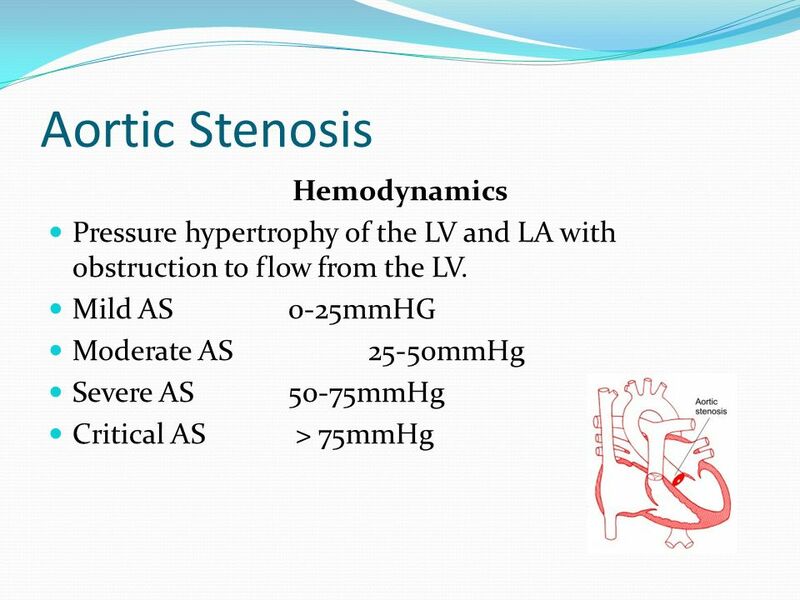 35 Aortic Stenosis Aortic Stenosis is an obstruction to the outflow from the left ventricle at or near the aortic valve that causes a systolic pressure gradient of more than 10mmHg. Accounts for 7% of CHD. 3 Types Valvular – Most common. Subvalvular(subaortic) – involves the left outflow tract. Supravalvular – involves the ascending aorta is the least common. 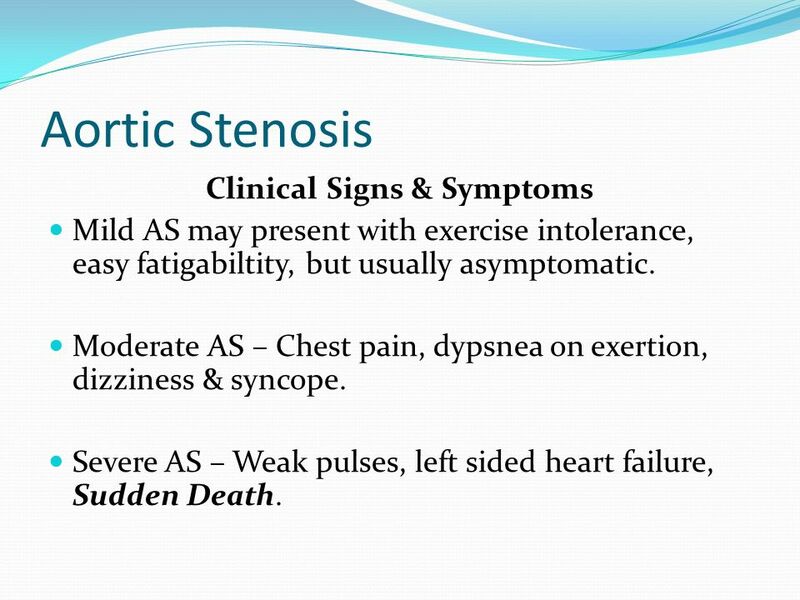 Aortic Stenosis Clinical Signs & Symptoms Mild AS may present with exercise intolerance, easy fatigabiltity, but usually asymptomatic. Moderate AS – Chest pain, dypsnea on exertion, dizziness & syncope. Severe AS – Weak pulses, left sided heart failure, Sudden Death. 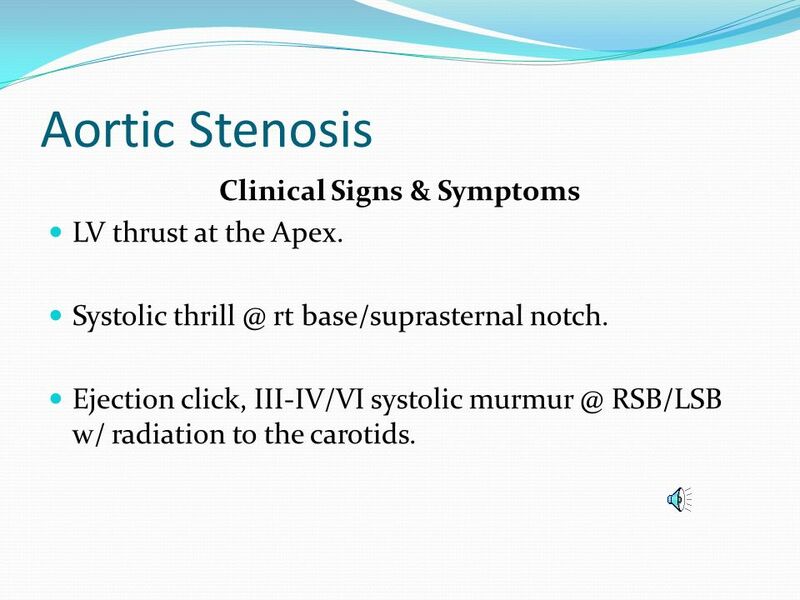 Aortic Stenosis Clinical Signs & Symptoms LV thrust at the Apex. Systolic rt base/suprasternal notch. Ejection click, III-IV/VI systolic RSB/LSB w/ radiation to the carotids. Because surgery does not offer a cure it is reserved for patients with symptoms and a resting gradient of 60-80mmHg. 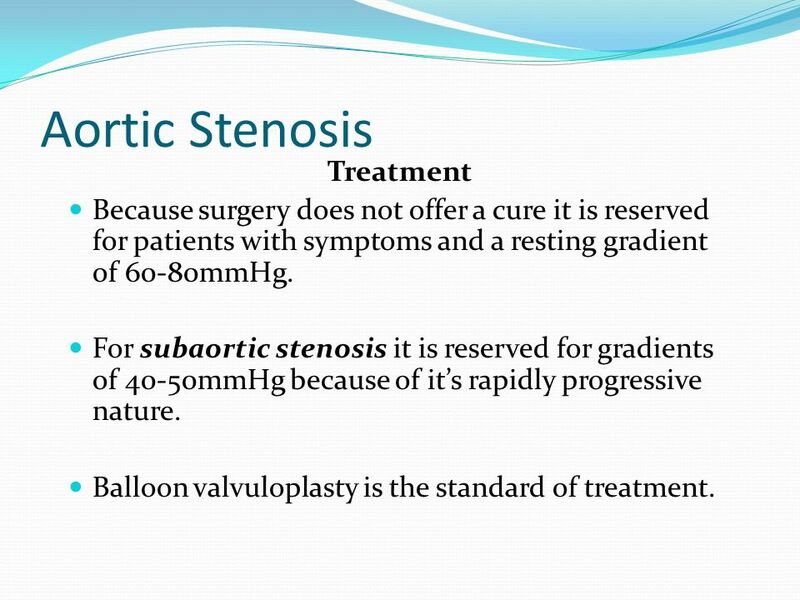 For subaortic stenosis it is reserved for gradients of 40-50mmHg because of it’s rapidly progressive nature. Balloon valvuloplasty is the standard of treatment. 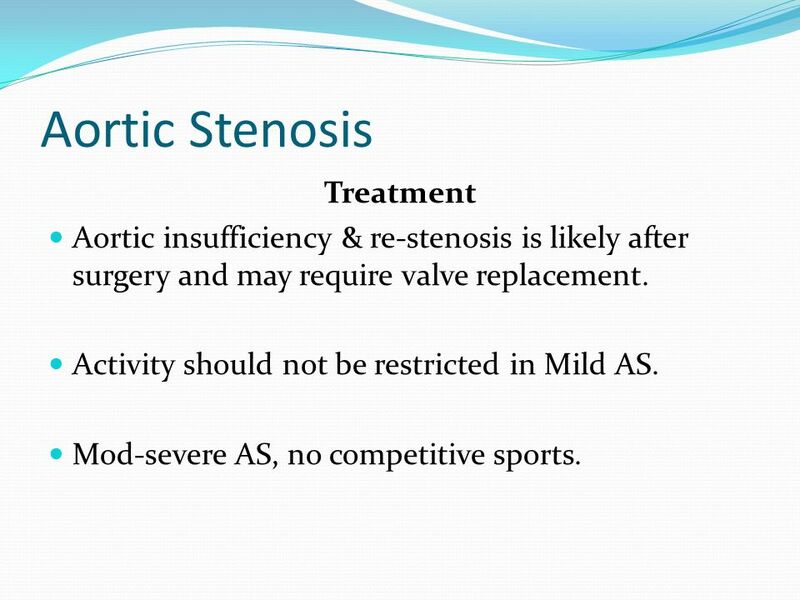 Aortic insufficiency & re-stenosis is likely after surgery and may require valve replacement. Activity should not be restricted in Mild AS. Mod-severe AS, no competitive sports. 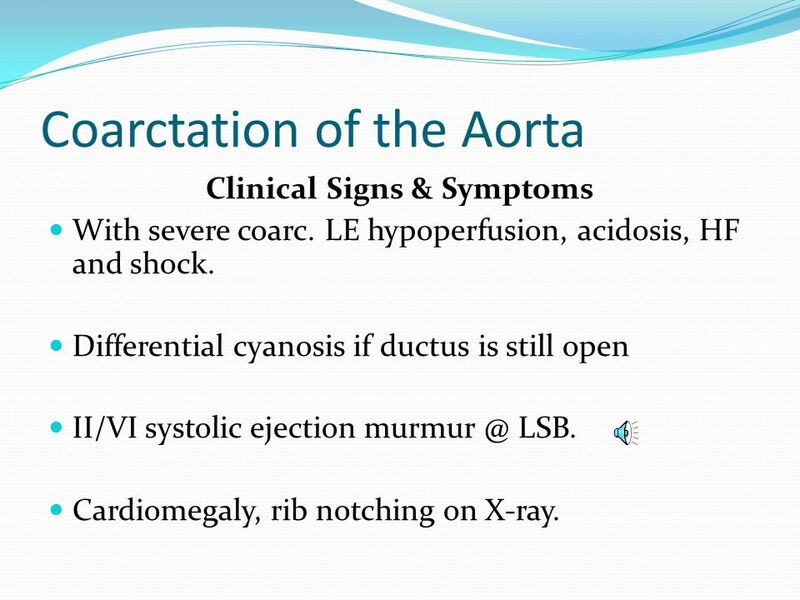 Coarctation- is narrowing of the aorta at varying points anywhere from the transverse arch to the iliac bifurcation. 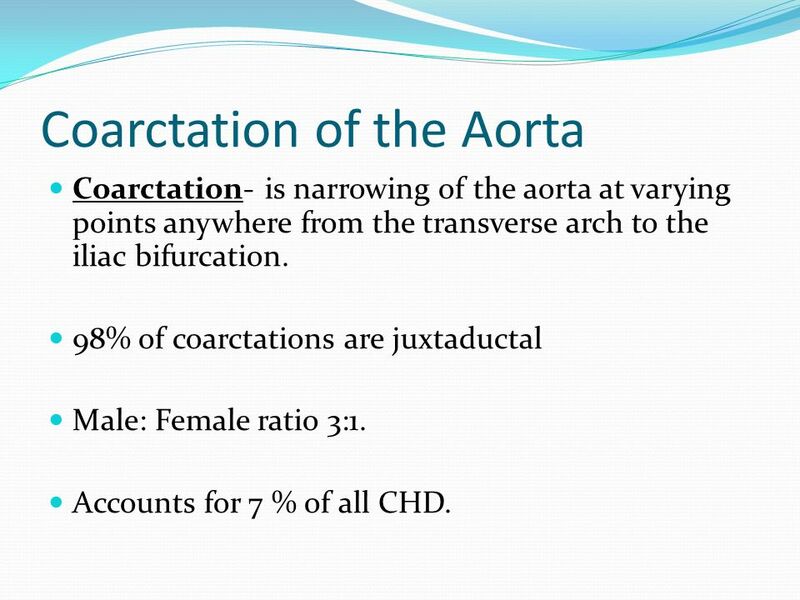 98% of coarctations are juxtaductal Male: Female ratio 3:1. Accounts for 7 % of all CHD. 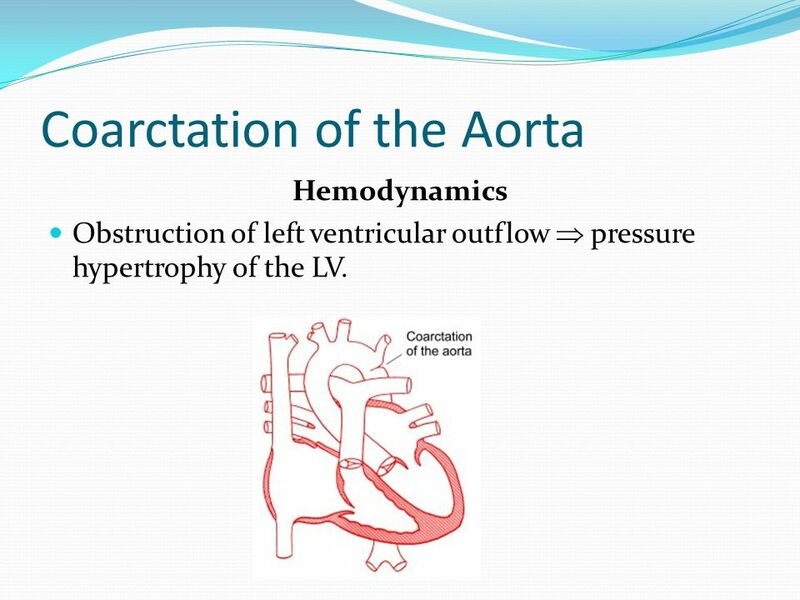 Hemodynamics Obstruction of left ventricular outflow  pressure hypertrophy of the LV. 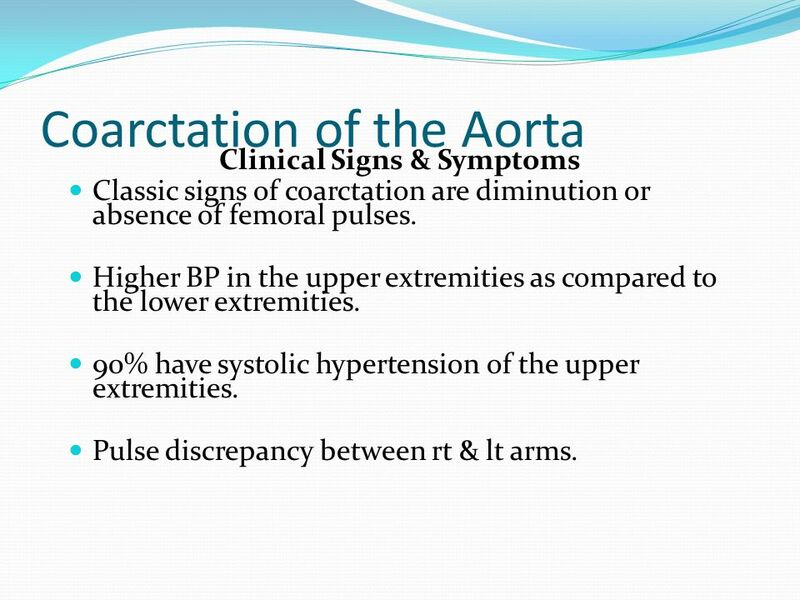 Clinical Signs & Symptoms Classic signs of coarctation are diminution or absence of femoral pulses. Higher BP in the upper extremities as compared to the lower extremities. 90% have systolic hypertension of the upper extremities. Pulse discrepancy between rt & lt arms. Clinical Signs & Symptoms With severe coarc. LE hypoperfusion, acidosis, HF and shock. Differential cyanosis if ductus is still open II/VI systolic ejection LSB. Cardiomegaly, rib notching on X-ray. 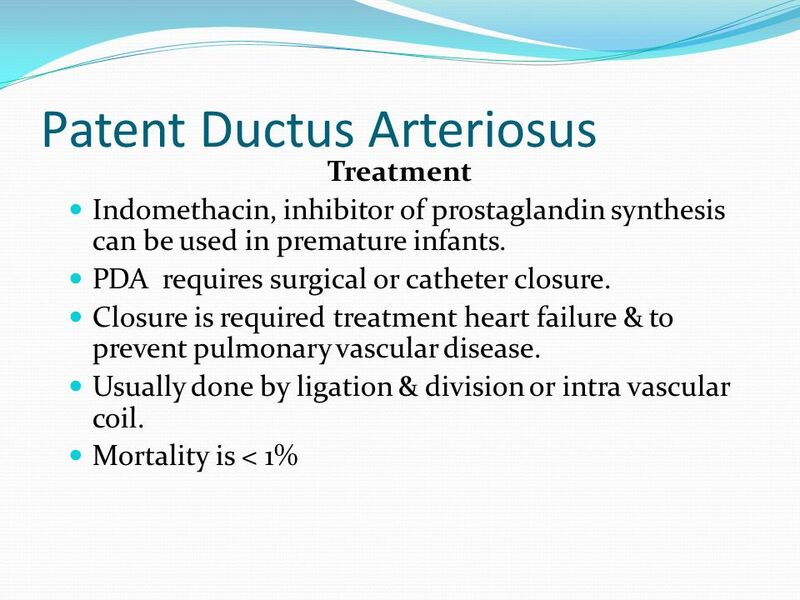 Treatment With severe coarctation maintaining the ductus with prostaglandin E is essential. Surgical intervention, to prevent LV dysfunction. Angioplasty is used by some centers. 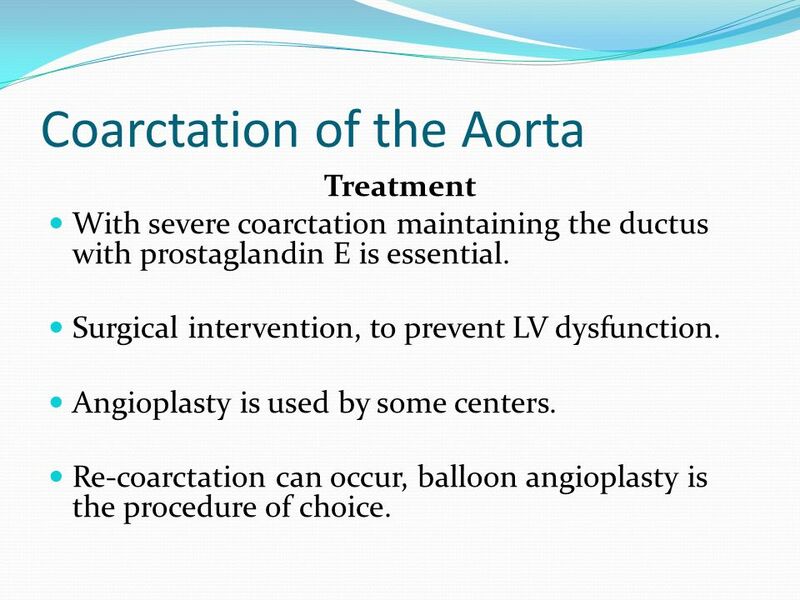 Re-coarctation can occur, balloon angioplasty is the procedure of choice. 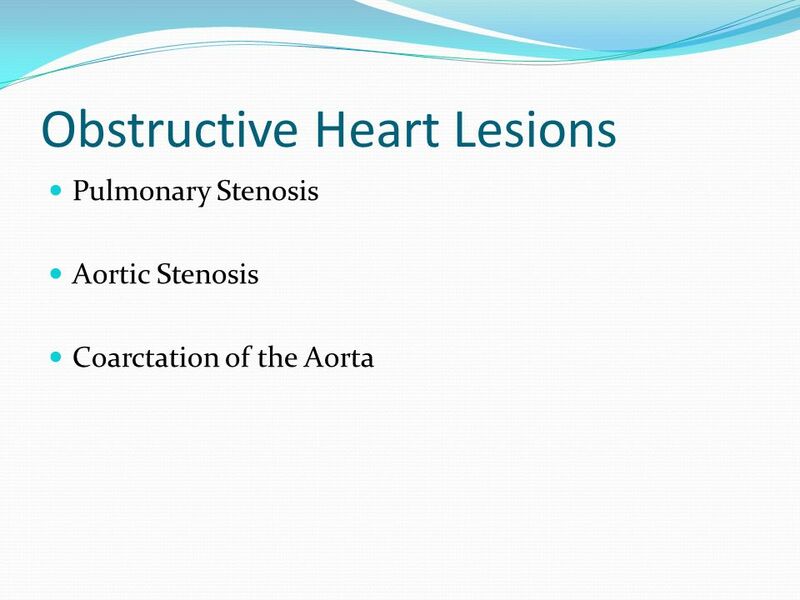 Download ppt "Congenital Heart Disease"
Aortic Stenosis Obstruction to outflow is most commonly localized to the aortic valve. However, obstruction may also occur above or below the valve. 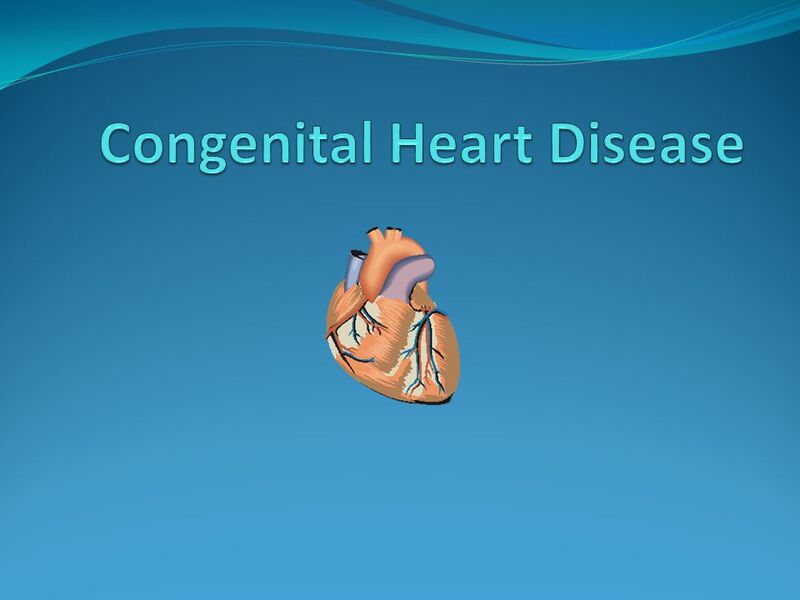 CONGENITAL HEART DISEASE IN CHILDHOOD Definition Cardiovascular malformation(s) resulted from deficient or interrupted development of heart embryo, or. 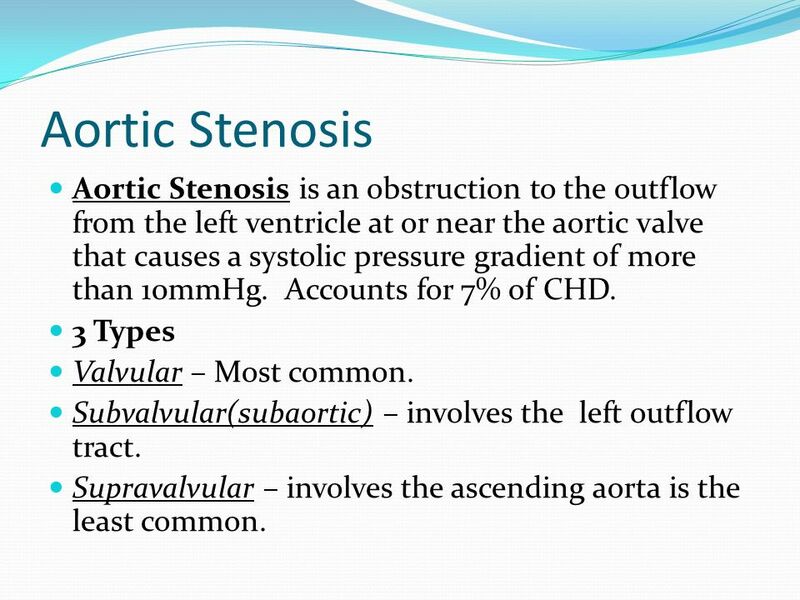 Mitral Stenosis. Etiology Most cases of mitral stenosis are due to rheumatic fever The rheumatic process causes immobility and thickening of the mitral.